Pippi Longstocking Joins Bee Blessed! 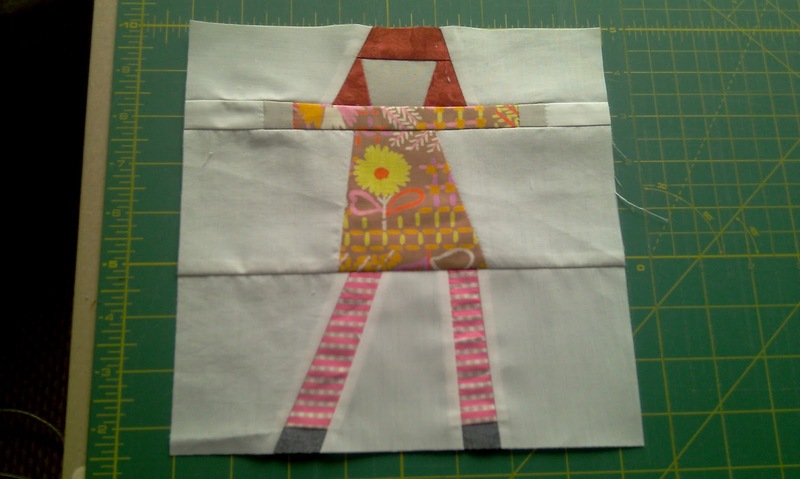 I told you the March block for Bee Blessed was going to be a fun one! 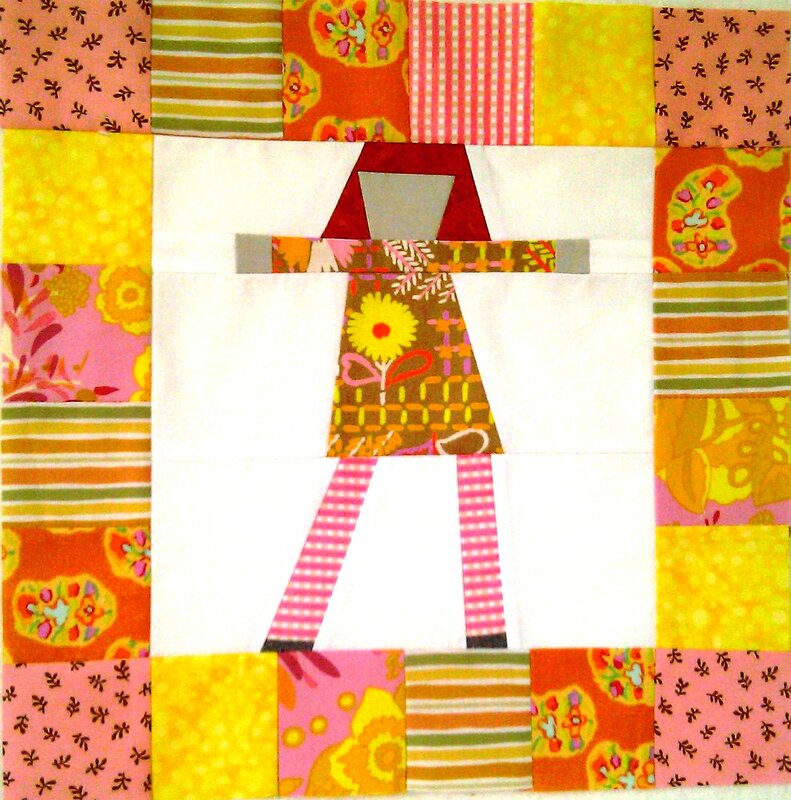 I’m sure you’ve seen this ‘pieced lady’ block around blogland. 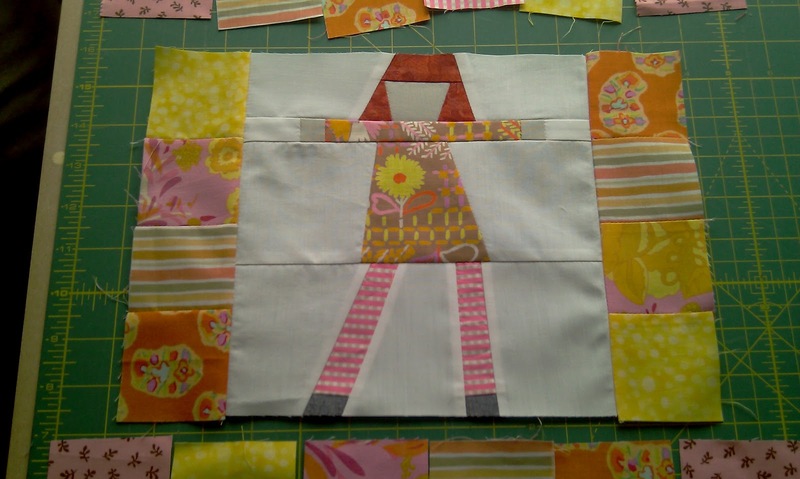 In fact, a few of my Brit Bee gals made some of these blocks to put in our Project 51 quilt for Terri. You can have a lot of creative fun with this design. I went for a daring red head with stripey legs, hence the name Pippi Longstocking. There is an element of improv piecing with this block, so for those of you who are comfortable with this method, please feel free to ditch this tute and go with the flow. All I ask is that you make the centre space 8″ finished, bordered with 2″ finished squares (20), leaving you with a 12.5″ unfinished square block. For those of you less at ease with improv piecing let me take you through this step by step. 1. Take a strip of white fabric, approx. 3.5″ x 10″ and lay a smaller piece on top. This will be the skirt. 2. Cut off the excess top and bottom. 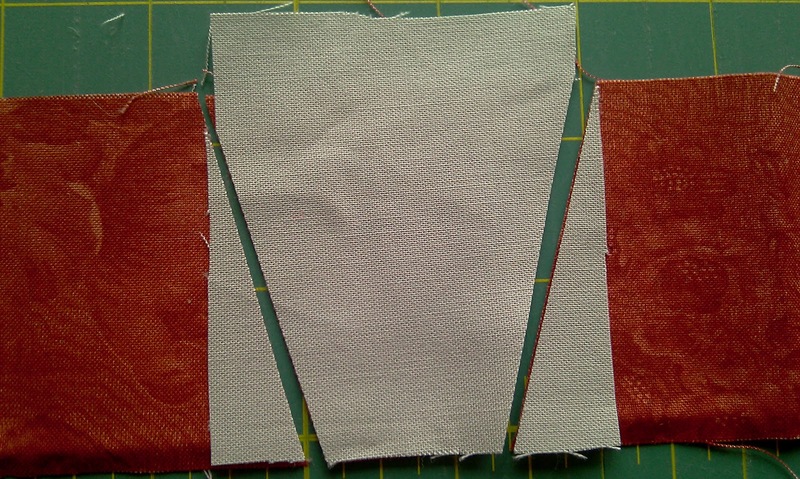 Then cut out the skirt shape, through both layers of fabric. 3. Remove the unwanted skirt fabric and underneath white fabric, and sew these 3 pieces together into one long strip. Trim the long edges to straighten the strip. 4. Next the arms. 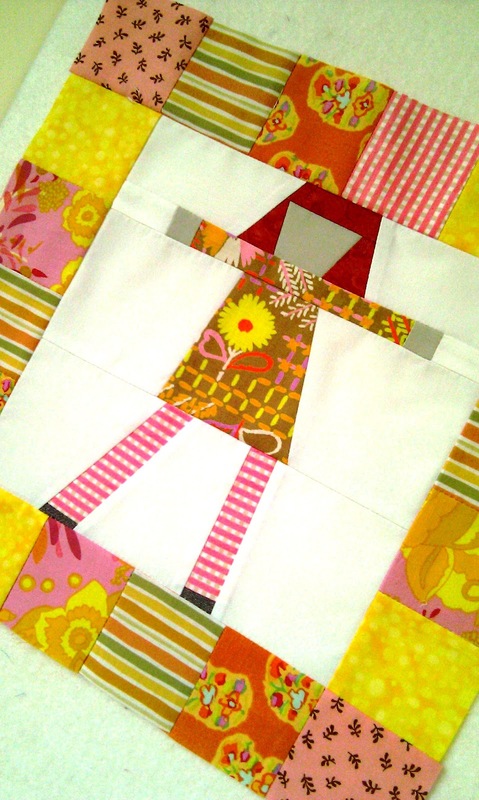 For these you will need a strip of fabric 5″ x 1″ and 2 x 1″ squares for the hands. 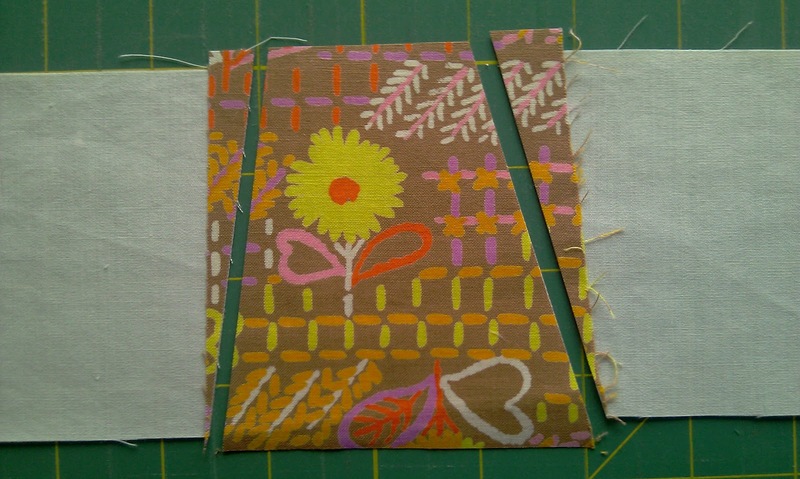 You will also need 2 strips of white fabric, 1″ x 3″. Join the pieces together to form one long strip. 5. Join the 2 strips together. 6. Next the legs! Take another strip of white fabric similar size to the last one. 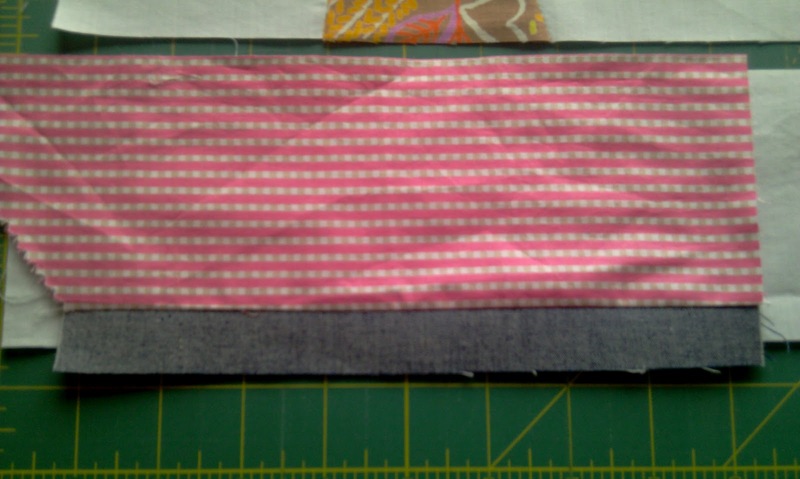 Choose your ‘legs’ fabric and sew a 1″ strip of fabric along the bottom of it. This will eventually form the feet. 7. Lay this fabric on top of the white background and cut out the legs as you did with the skirt, cutting through all layers of fabric. 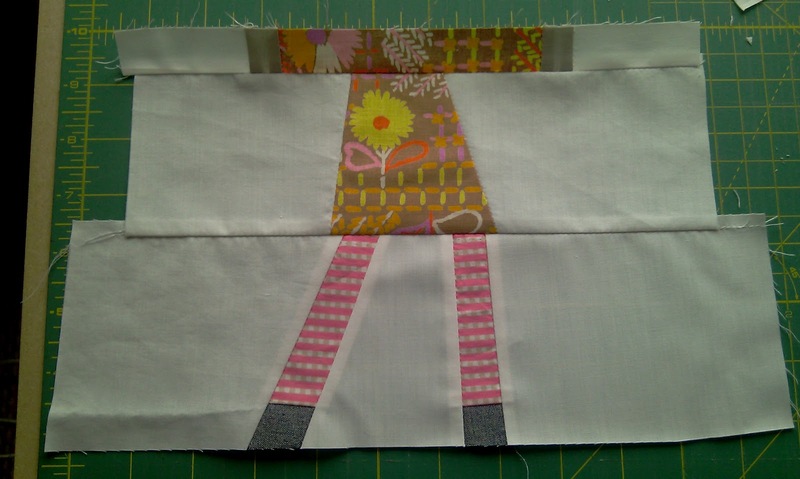 The legs should be at least 1″ wide as this will be only 0.5″ finished! The first set of legs I did ended up way too skinny! 9. Now for the head section. First take a piece of fabric that will eventually form the hair, approx. 2.5″ x 5″. 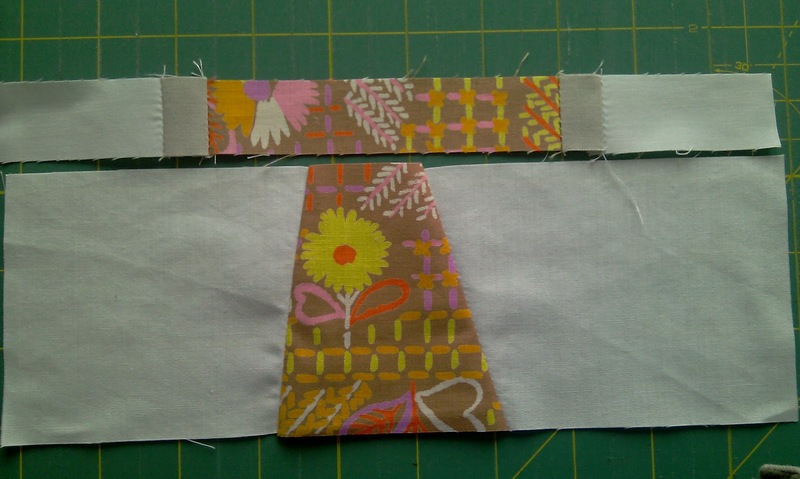 Then place a 2.5″ square of ‘head’ fabric in the middle of the hair fabric. As before, cut the head shape through all layers, and remove the unwanted sections. 10. 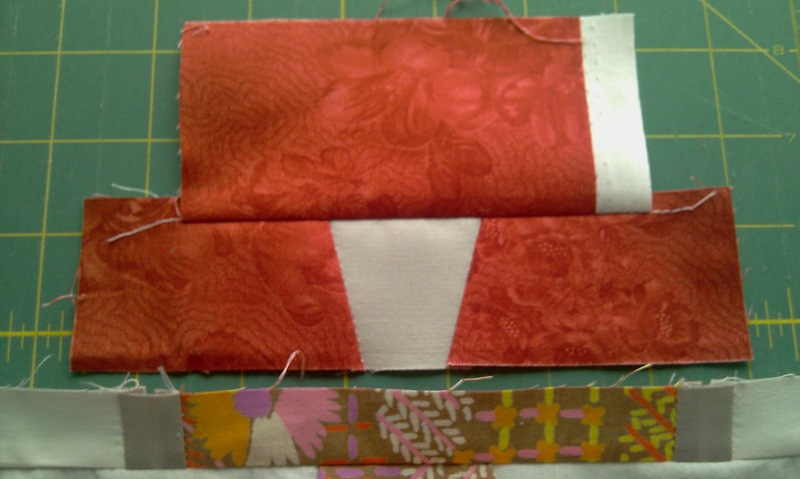 Sew the sections together. Add one more piece of ‘hair’ to the top of the head. 11. Lay a piece of white fabric underneath the hair/head piece and cut out the shape of the hair, through all layers of fabric. 12. Remove the unwanted bits of fabric and sew the background pieces to the hair/head section. 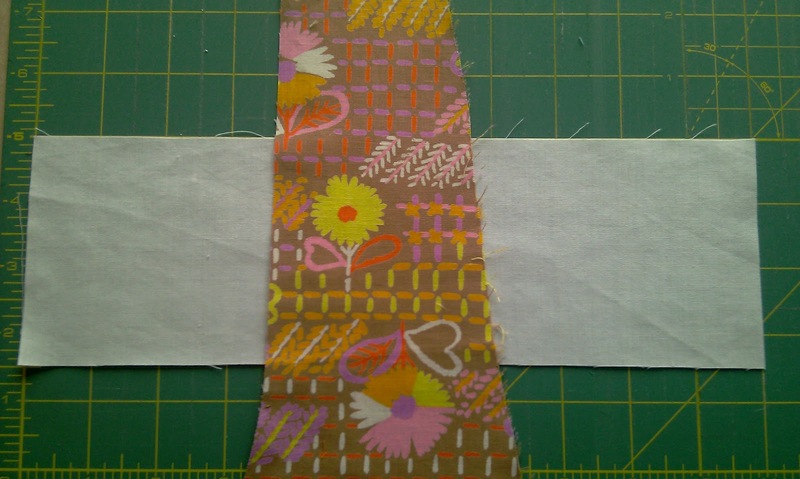 Straighten up the edges of this strip as before. Finally sew the strip onto the arms/legs piece. 13. 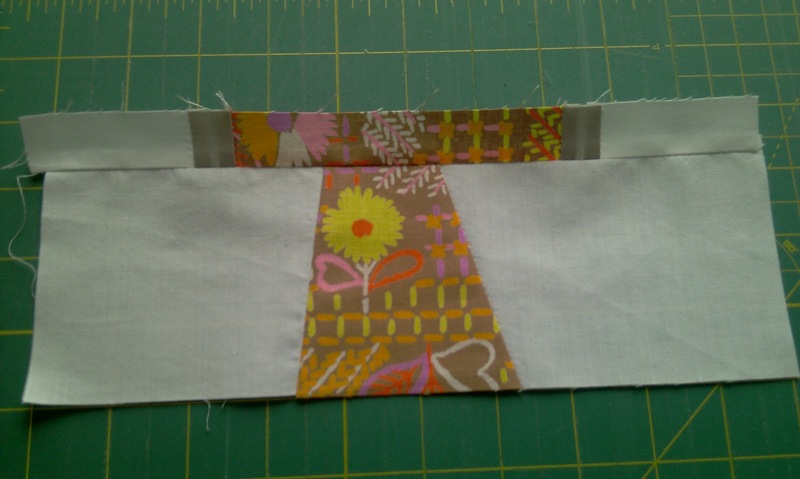 Trim this piece to 8.5″ square. 14. 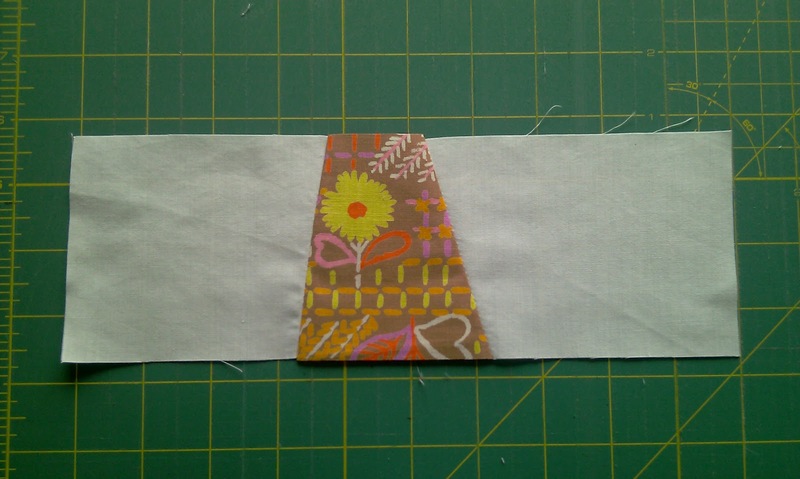 Sew 4 of the 2.5″ border squares together, iron and attach to one side of the centre piece. Repeat for the other side. 15. 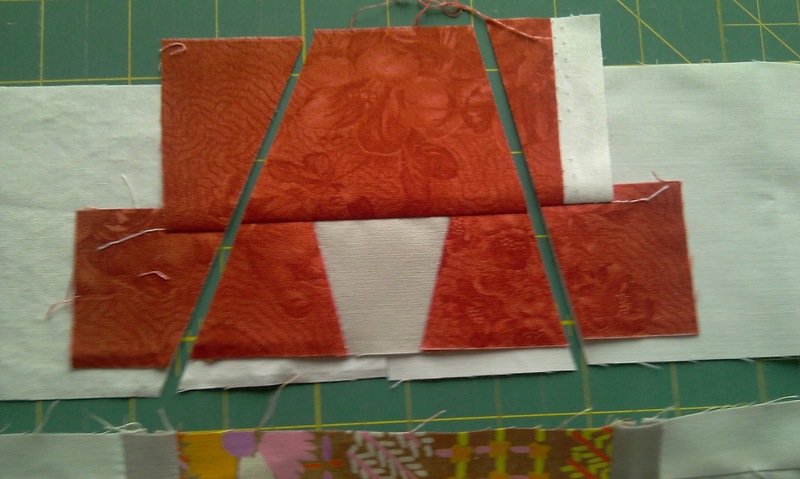 Now sew the remaining 2 sets of 6 squares, press, and attach then to the top and bottom edges. Press the seams away from the centre and square off to 12.5″. Sorry for the long-winded tutorial, but really you just want to have fun with this block. Your girl can be anything you like, as long as the centre piece ends up 8.5″ unfinished and the outer borders are made up of 2.5″ squares, then anything goes (please keep the background white). There are more examples on FLickr, but I can’t seem to access it at the moment, so no links, sorry. Previous Previous post: My 3 Number Ones! Next Next post: Oh It's Me!! !